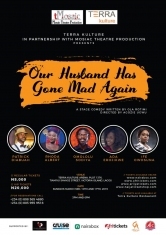 Click to enlarge Ola Rotimi’s play Our Husband Has Gone Mad Again, tells the story of Lejoka-Brown, an ex military major, who has taken to dabbling in politics so that he too can partake in the ‘national chin chin’. One of his problems is that he does not have the slightest understanding of the workings of politics, relying instead on his military tactics and manoeuvres to conduct his ‘surprise and attack’ campaign. Even bigger problems are his three wives! He inherited the placid Mama Rashida from his late brother; the feisty and upfront Sikira was purely a strategic marriage because her mother was president of the National Union of Nigerian Market Women and their vote was vital to him winning a political post; then there is Liza, the westernized woman he married whilst fighting in the Congo. The twist of the story occurs unaware of her other ‘sister’s in marriage’, Liza who has been studying to become a doctor in the USA decides to join her husband in Nigeria in the middles of his political campaign and crisis.